Electricity saving box or energy saving box or a.k.a power saver is a real scam. Many people became victim of this product. Advertisement said a 30-60% decrease in electric bill every month with matching demonstration that the current is actually become lesser when the electricity saving box is plugged in. Ordinary people (with no background in electrical or electronics engineering or related discipline) are surely convinced by their lies. As an electrical/electronic engineer, practitioner and hobbyist let me tell you and share a little education how this advertised electricity savings box works and to reveal its great scam. Real Power – this is the true power each appliance consumes and this is the power considered by the electric utilities to charge to their customers. Apparent Power – this is the total power including the power losses in the transmission lines or simply the power delivered by the electric utility. The electric distribution companies are charging us through real power we consumed, not with the apparent power. The real power our appliances consumed is following equation 2 above which is the product of voltage, current and the power factor. The electricity meter used by electric utilities is capable of detecting the voltage, current and power factor and able to compute for the real or true power consumption. Most of the times, the sales representative bring with him an electric fan and a multimeter. 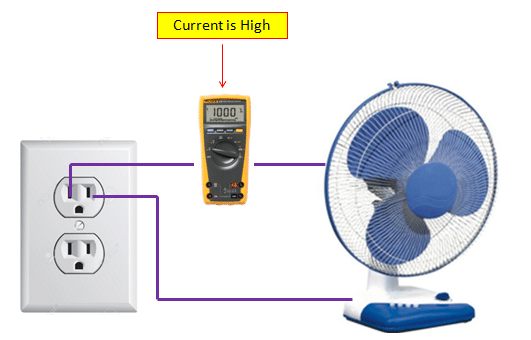 They use the multimeter to measure the current that drawn by the electric fan with and without the power saving box. Initially without the energy saving box, the current on the multimeter is high. The current measured once the energy saving box is plugged in is definitely lower than the initial current. Ordinary people are surely amazed and purchase one but they do not realize the savings as advertised! Without the Electricity Saving Box plugged in, the current reading is high. Once they plugged in the box the current is much lower. They then concluded a big savings when using their product. BUT WAIT…How they perform the demo? Are they showing evidence on actual power consumption with and without the box? What they did is only getting the current drawn by the appliance. They multiply the current to the voltage and claimed that this is the power consumed by the electric fan. This is not yet the real power consumed by the electric fan. The real power always includes the power factor on it as illustrated in equation 2 above. Actually, the real power is fixed. For instance, an electric fan is rated 100W. 100W means a real power. The real power is constant as well as the wall outlet voltage is fixed. Therefore, the above equation is only dependent to the power factor PF. The higher the power factor, the lower the current or the lower the power factor, the higher is the current. 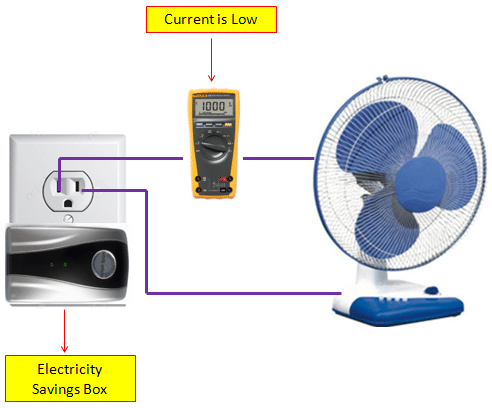 Without the energy saving box, the current will be high and it will be lower once the box is plugged in because the box itself is making the power factor higher. On the demonstration, they are not emphasizing this. I don’t even think that these sales personnel know about power factor. They are not engineers or really skilled and knowledgeable on electricity related things. You may challenge these persons to get a real power meter so that a real power will show. I am very sure that they don’t make it because they will be showing a constant real power drawn by the appliance. Electric Companies are charging us by the real power we consumed. The real power is always composed of voltage, current and power factor not voltage and current only. If the current is high with a constant voltage, the real power will be the same since the power factor is low. If the current is low, do not be excited because the real power is still be the same since the power factor will be high. Below table is an actual characterization results on a particular equipment power consumption (I am referring to the real or true power that will be read by the electric distribution company). I have three iterations wherein I changed the effectiveness of my power factor correction circuit or A.K.A. power saving device that we design for our products. The meter used here is Yokogawa WT310 digital power meter. The data in all columns are measured by Yokogawa WT310 digital power meter. The first trial has worst power factor, so it has the highest current reading. The second trial registered an improved power factor thus the current decreases. The third trial has the best power factor of almost unity (the best case for power factor is unity). It has the lowest current. However, observe the power consumptions, the three trials all have the same power consumptions of around 275 Watts. By multiplying the voltage (yellow column) and current (blue column) will not give the real power but an apparent power. Energy saving box advertiser do consider only the input voltage and the current drawn because what their multi tester reads are only voltage and current but no power factor. They put to the minds of the customer or audiences that the power the electric company read is simply the product of the voltage and current but it is not. A clearly dishonest and misleading demonstration. Let us start by defining the operation of this claimed an energy saving box. It is simply a power factor correction circuit. A power factor correction circuit provides correction to the power factor so that the power delivered by the energy company is the same to the power that is actually consumed by the consumer. The ideal value of power factor is unity or 1. When the power factor is unity, this makes equation 1 and 2 equal. Majority of the consumer’s load are inductive in nature such as electric fan, aircon and washing machine to name a few. For inductive load, the power factor is always below 1. The claimed energy saver is actually a power factor correction that is most of the time a capacitive network to counteract the effect of naturally inductive load. As the power factor decreases, the current will increase. As the power factor increases, the current will decrease. However, the real power that is consumed by the equipment/appliance is the same. Real power cannot be measured by simply using a multi-meter as the advertiser did. Advertisers must use power factor meter to demonstrate the reality but I believe they will not make any move that will jeopardize their business. Energy saving box is actually a power factor correction circuit. It is a capacitive circuit to counter the effect of inductive loads (residential and industrial loads are mostly inductive in nature). It can be a passive or active solution. A passive solution is just a simple capacitive circuit and only effective for linear inductive circuits but with almost no effect on non-linear systems. On the other hand, active solution uses active devices or circuits to correct the circuit power factor. This is very effective for both linear and non-linear systems however very expensive and complicated. Below is a waveform of voltage and current of an inductive circuit. As you can see, they are out of phase. The ideal case is for them to be in-phase. With this circuit, the apparent power will always larger than the real power. This is a disadvantage for electric companies since they are supplying more power than the customer actually consumed. When a passive power factor is included or installed, the current and voltage will become in phase as below waveform. When this happens, the apparent power and the real power will be equal (ideally unity power factor). This is very good for electric companies as they do not waste power. 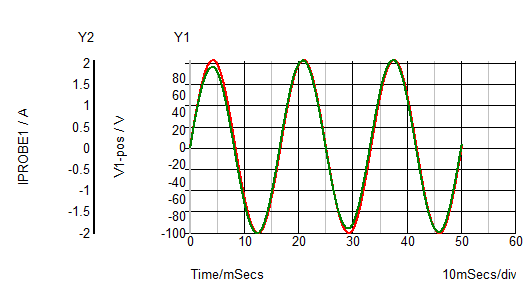 Below is the waveform of voltage and current of non-linear systems. Non linear systems include rectifier and switching converter. The shape of the voltage is intact (sinusoid) but the current is very distorted which emphasizes a very low power factor. Considering the same power drawn by the end users, the effective value of the current will be high thus results to higher losses in the transmission lines and a big loss in the part of the electric company. With a power factor correction circuit installed (particularly an active PFC), the current shape will be corrected and restore its sinusoid shape the same above. Whatever the rated power of your appliances, this is the real power that the electric companies will be charging to you. The rated power or the real power drawn by your appliances is always composed of the voltage from the wall outlet, the current and the power factor. Advertisers and vendors are only considering the voltage and current while neglecting the power factor. Always remember, when current is high, the power factor is low that will result to a same real power. If the current is low, the power factor will be high which also result to the same real power. You can’t save by using energy saving box. The use of electricity saving box does not give energy savings to consumers. Electric companies are the one directly benefited if residential use energy saving box. However, if all end users will use energy saving box, there will no extra fix losses on the transmission lines and the generation cost will be lower so residential do not shoulder it anymore. In this means, residential have savings (a very small savings) on the generation cost which is most of the times are on top of the actual energy consumptions. Do not buy the idea of saving up to 50% of the monthly bill using energy saving box because it is a scam and very dishonest claim. This is true. Your savings will be, P=I.I.Resistance. Even when current I is reduced, the resistance in a short house wiring is less. So that your savings will be minimal even when your current, I is reduced . Your savings will be apparent only in a large installation such as in a factory. I am a factory electrical engineer, and I have installed capacitors electric motor terminals. Electricity savings is noticeable because power loss, I.I.R is reduced when current, I is decreased. My daughter once brought home from Manila a power saver gadget which is plugged only in a house outlet. We have tried using for a year, but, no power savings was noted. Yes, I agree with you that for a huge factory there is a a savings on the losses of the wires when a power factor circuit installed. Broke mine open to see whats inside. The scam is real. it contains a small circutboard with 4 resistance’s and 2 green diods. That’s it!! Do not be afraid opening yours. It isnow where it belongs, in the trash with a good laugh. Yes, I agree that you can have a savings on the power loss due to resistance in a huge factory or building with long wiring. But with a small house, I doubt about it. Most houses are not so small. Light, Refrigerator, Dryer, Washer, Heating. Can you install such a unit near the washmachine and dryer? You haven’t tried it . Please let me know if you truley felt like there was a decease on your electric bill. thank you for enlighten me on the electricity saving box and save me the P2k. salamat. I once bought a box called powermaxx in manila at handyman, I bought it for 1,500 pesos. After 1 month no change in my bill, after 2 and 3 months still no change(I was starting to regret my purchase), but on the succeeding months my bill dropped by 30%. Plus i dont get busted chargers anymore. I think that the saving is more noticeable when you are using motorized equipment and power hungry devices like selectric stove and oven, hot iron. Im still using it and my bill never exceeded the 1,600 pesos it used to be 2000-2300 pesos a month. Plus i get clean electricity. I learned in some forums that it’s only a capacitor and it cleans your power making it more efficient. A capacitor alone also draws current if put across the line, in order to get any form of cost reduction the majority of the loads in use must be inductive. Thank you for this review. Am I right that they only plugs the gadget? If it is, then I think its only an additional load to my electricity bill. However if the appliance will go through the gadget or we plugs our appliances to the gadget and it will do the magic then I might believe that it works but still I need to know how its system works if its really what it says that helps decrease your consumption. Coz I believe that we can make something to lessen the consumption’s but I don’t know if conversions will work. But anyways THANK YOU for this info. Yes, you just plug the gadget to an outlet. your explanation about the gadget is good. tnx for the info. yes! thanks so much for the explanation. It enlightened me about the gadget. Its truly scam. Is there any electricity saving gadget/device in the market which is really work? Or none of them really working (just a scam)? It is kind of like the elusive perpetual motion machine. If you really did not need all the energy that physics requires in order to move an object, you would have “extra” energy. Then you could invent flubber, because extra energy could be continually added rather than decreased. Unfortunately, reality requires a certain amount of energy to move an object, including factors like gravity, friction, and other things. The way to save energy is generally to ease a load as much as possible, with lubricated bearings, efficient circuits, etc., while the load itself always remains what it is. So, basically, the way to save energy is to get fantastically efficient devices that require less power to do the same work (e.g., use LED lights instead of incandescents for the same illumination, get efficient heating thermostats, and things like that). Of course, the other alternative is to simply do less “work”: turn off power when not needed, and don’t use power for anything that doesn’t need to be done. Similar savings methods apply for water and other utilities, combining efficient use with efficient non-use. THIS is the best comment I have read! Turn off what you do not need. It will indeed save the most money! even with a minimal energy savings due to power factor correction characteristics of this energy saving box,it is still a plus for the environment.the real energy savings is within us-we must save electricity to protect our environment and our children’s future. You did not understand, minimal savings really do mean minimal, negligible actually. Any resistive load will have zero savings. On the inductive loads, such as the washing machine (excluding the heating element), the loss of electrical power in your house wiring is already negligible. Power factor correction can then save mabe 1 percent or so from almost nothing. We’re talking about fractions of pennies! If u really wanna save any of it, move the appliance closer to the power meter. That way you also have a saving on the resistive portion (the bulk of high residential power used), albeit not much as the power loss in proper house wiring is already minimal. When you consider the energy it takes to make and ship the scam box it has actually a negative total energy balance. It is a loss to your wallet and the environment. Don’t buy it, and if you already bought it, return it. 1 percent / month will be 12 %/year ! 1. Your electricity supplier charges you at home for real power. Any talk of real and apparent power is irrelevant and any talk of power factor correction using such a unit is irrelevant. 2. If you plug this unit in and the light on the front glows, it is using real power or the light wouldn’t be on would it, so your bill goes up by definition, not down, as its real power consumption is added to your other real power consumption..
3. If something sounds too good to be true, it usually is. Do you seriously believe the power companies would allow a 50 dollar box from China to reduce their turnover by 50%? 4. If you could save 50% on your power bill with a 50 dollar box from China they would be wired into every house and your power company would have adjusted their rates to assure their profits already, along with smaller power lines, power stations, etc., so that their costs would reduce, making them even more profit. 5. For every 1000 people who see the plain facts of 1 – 4 above, 1 person will still believe you can get something for nothing and they are the scammers profit margin! 6. The scammers are wearing gold watches, driving big cars, live in big houses, have 6 figure bank balances, holiday 51 weeks of the year, drink champagne, eat caviar and sell these boxes the other 1 week of the year. How are you doing? Thanks for the technical explanation. I was doubtful about this gadget from the beginning and of course didn’t buy it. I only wonder about all those enthusiastic user reviews, telling how less money they laid for the electricity. Are they all telling lies? 1. In a huge building that has very long wiring. Remember that this gadget is a power factor correction thus it will smothen the current therefore a lesser power dissipation due to the wire resistance. However, in a regular house, the saving due to the wire resistance is negligible. These advertisers should clarify the conditions when this device should have benefits. These advertisers are fooling people by saying they will save from their TVs, DVD/MP3 players electricfan and soon. These devices are having shorter wires only and not logical to have savings. 2. This device will have effect on high power motors and other current hungry tools. However, being a plug and play device is not that effective enough to provide a very good power factor correction. Another thing is that specific application will require a specific power factor correction as well. Then you have this product that is claiming to be a universal powet factor correction…it is not the actual situation. Not the people from the comments, but the comments themselves are all fakes. For example, in one one the scam sites I reviewed, all comments were apparently from facebook. But, upon inspection of the source code of the page, you can seem the comments are not from facebook, the pictures are not from facebook, all fake. Try to post a review saying it doesn’t work, your post will never get to the page. All fake. I totally agree with you on the constancy of consumed power. Based on your analysis of the energy saving box as a capacitive circuit, it is still useful in reducing current consumption and heating effect on devices. Basically, I think power factor correction is a good thing. If you also consider a clime where power meters are low quality and poorly regulated, reducing current may actually reduce bills. This box might actually be useful after all. Yes, I agree that this device may have use on specific application but not as advertised as universal plug and play power saver. I explained this on my reply above. Just always keep in view that the % percentage always remains same. Either on high or low loads like, on 100$ you will save .30$ and on 300$ you will save .90$. The friend who wrote a very lengthy article above surely belongs to any electric supply company as he already admitted in para above the conclusion that it will give the loss to electric company. As you corrected the line loss of your home but the line losses are still there. Which the supply company is charging from you. Some times they also play game by reducing voltage so the current is increased by the appliances used by the consumers and they earn more money. Greedy and Cheaters. Earning money by cheating or misguiding others is bad and sin. A power company would never reduce the voltage to cause customers to use more power. True motors might use more power but stoves and lights and other totally resistive devices would use less. Electric motors could also overheat and be damaged if voltages are too low. If the watts increased it means your bill increased and vice versa. When your appliances drawing less current, it will reduce your bill too. Haven’t you read the article? Multiplying voltage by current gives you ‘volt amperes’, NOT ‘watts’.. To get watts, you multiply voltage by current by power factor. As the device saves bill where high power equipments are used, is it recommendable to use at places like factories, cinema halls, malls etc? The establishments you mentioned requires more powerfull design or product. A customized and designed specific power factor circuit will be needed, not just this plug ang play. I’ve been in the power electronics more than a decade and we design power factors corrections. No such PFC circuit that is universal to all. Well you can still use a working PFC to another circuit but dont expect the same performance. No, PF correction must be done right, at the right place. Done wrong or impromptu at the wrong place in the electrical network can even make it worse. If you visit most of the blogs that advertise these products, you see testimonies from users who claim that the product works for them. As an engineer, are you willing to dismiss these claims as placebo effect? Remember it’s money we are discussing here, and I do believe a full grown adult should be able to tell when they are paying less than usual in a bill. Your theories are centered on the fact that electricity companies use the formular V x I x PF to calculate the power consumed. You did not consider that this might not be the case world over. What if in some countries, the power companies put the burden of power loses on ignorant consumers by charging them with Apparent Power (V x I), then this device will definitely cut their electricity bill significantly. Thanks for your effort though, much respect. But there are so many testimonies from my country that I would love to conduct my own experiment before I dismiss the product. Thanks for your comments. My review here is based on the actual observations how the advertisers in our country did to convinced people to buy their products. These advertisers not even know what is power factor. For them, once the current decreases, the electric bill will then decrease. This is clearly a lie. In my comments above, I did agree that these power savers will have a help in some way in a huge building or factory with inductive loads. In a large building, wires are longer and thus the resistance are higher. If there is no power factor correction installed, the current is very nasty and this will generate loss of I square R. However, a sophisticated power saving device not just the plug and play one is needed to realize the savings. If these persons you mentioned really saved money from their bills in using this product, then it is good and they should start using it. You yourself as well you can try if these power savers are really effective. I don’t think if there is a country that charging electricity from the apparent power. You may proceed on conducting your own study regarding the product. There was already a published article in the newspaper in my country the study result of 4 kinds of power saving device. It was conducted by one of the largest electric utilities in the country. According to them, the alleged power saver none of them are reducing energy consumption but adds load based on the meter reading. This is the link: http://www.philstar.com/cebu-business/2013/10/30/1250952/veco-warns-public-against-power-saving-devices. Good luck on your own studies! Electronicsbeliever – I support your findings but think you need to improve your presentation. I too am an engineer and understand the power factor. But most readers will either accept what you say without understanding it or just be more confused. Here’s what I suggest – talk to customers about inductive devices, those which use motors. The bigger the motor, the more the inductive effect which increases the power factor. Resistive devices such as ovens, electric heaters, and the heating elements in clothes dryers will have no effect. There are only a few capacitive devices in the average home and they will be found in the control circuitry of your air conditioning unit, here’s why: this is likely the highest HP motor in your home, it is constantly turning on and off as the heat load changes throughout the day. Every time it starts up, it creates a large inductive surge in your power circuit, so they placed some capacitors inline to charge just before the motor starts and they are discharged every time the motor starts to reduce that surge. I don’t know where else in your home you’ll find capacitors except in electronic circuits. Since these have been getting smaller and use less energy, I thik we can ignore them as a useful source of capacitance. But the modern home contains likely 100 motors from the water pump in a dishwasher or washing machine to the tiny motor that rotates the plate in your microwave oven and the fans that cool your PC. The second largest motor you’ll find is the pool pump which runs most of the time. Modern pool pumps have 2 speeds so the load is decreased whenever possible, saving you more money than this phony little capacitive device. BTW, in engineering classes they told a story about an engineer who had a lot of heavy tools in his garage. So he built a rather large capacitor into one wall of his garage and he would activate it whenever he was using these tools. He saved a lot of money too, until the power company technicians figured out what he was doing and forced him to remove it. Not certain about the legalities of that, or maybe it was just a story. Those testimonies are just fakes man. Try adding a testimony there saying it doesn’t work, most blogs you won’t be even able to post, if you do, your post will never get to the site. Simple as that, all fake, not real people, not real testimonies, try and see for yourself. Thank you so much for sharing such a nice article. Its really help a lot. please keep sharing these types of articles in future as well. Thumbs up for a great work. GOOD WORKING & VERY GOOD IDEA. Nice article you’ve shared, indeed most of us do not got the basic idea of how’s this device actually works on saving the bills. Perhaps you actually could give us some advice on how to really save the power consumption. Thanks again for the explanation. I knew a guy who saved on his power bill using four nails and two lengths of car jumper cable. The two years he served for power fraud meant his power bill was zero during that time! I saw videos on YouTube showing the electric meter slowing down with power saver switched on. How do you describe that? Is it also a scam? I didn’t see in your calculations any thing about imaginary power measured in VAR. the power dissipated in a purely capacitive circuit and being a capacitor is defined as 2 plates separated by an insulator is virtually impossible to pass current through it. Whereas Inductive circuits have wire coiled around a core which has a measurable amount of resistance. I taught College Electronics for 21 yrs. and to explain just one math function takes about 1/3 of a quarter to explain. That math function is called the vectorial summation. So the real concern is what does a power meter measure? On the meter It states it is measuring Watt hours a measure of P=IV times the number of hours it has measured which is what is displayed on the meter. If you’re serious about reducing your electricity bill, get your home professionally insulated, including double glazed argon gas filled window panes, doors and window seals, sprayed polyurethane foam (SPF) on walls and ceilings, or R19 fiberglass ceiling batts or rockwool thermal blankets; install energy efficient LED lighting; install air conditioning compressor waste-heat recovery system, or solar heater for hot water. Air conditioning compressor heat pump to supplement home heating. And if you’re in a single family house, install solar panels on your roof. Wish i had read this article beforehand! I know it is a long time since it was posted but anyway I want to share my comments here. I did the measurements myself. I have bought three types of this magic power saver. All of them are scam. I uploaded the measurements video in my youtube page but the language is not English. There are many many videos in the youtube explainig and proofing that this is a scam. 1. This power saver cannot reduce the power at all. 2. It may improve the power factor for only some devices. These devices are only the ones that use magnetic field to operate like flourscent lamps and some old air conditioners and washing machines (inductive loads). This is why we all noticed that the advertizers demonstrations videos are only applied on some flourscent lamps or induction motors. I didn’t see any video on using this saver with resistive loads or other electronic loads like PCs, TVs and phone chargers. 3. For resistive loads, the power factor is already unity. Connecting this power saver increases the consumption by less than one watt because the green LED lamp and the electronic components inside it. 4. For appliances like TV, laptop, CFL lamps… etc, the power factor becomes lower and the current increases which make the situation even worse. (The watt is of course constant in this case). The voltage goes up and so does a fan run faster and when it does run faster due to pressure pushing amps then you use more watts and more cost but if the voltage is lowered then the watts will not be as high. Just try and see if 90 volts saves money over 125 volts and then you will know. I’m not using any power saver device. Just doing basic energy saving measures such as maximum use of daylight, practice energy management, etc. This save about 64%. If you Really want to try one…they are about $5 on Amazon! I’m curious with this another electric saving device that this filipino inventor is promoting. Could you please try to check on this too? thanks! Also came here because of a facebook sponsored ad about JL E-saver that claims to save energy… it has a different concept from the previous power saving boxes but wanted to know it it’s real pr not. @ Bill: THIS is the best comment I have read! Turn off what you do not need. It will indeed save the most money!